Goose Guardian is an innovative, cost-effective Canada goose deterrent, and it is the first ever animal deterrent to provide demand performance - meaning it only goes off when geese approach. The Goose Guardian is designed to be an automatic, unattended feature-protection solution for repelling Canada geese and preventing them from trespassing on travel corridors, areas adjacent to water features, docks, and other locations where goose poop causes a nuisance. One of the most prevalent patterns for geese presence is for the birds to land in a water feature and then to exit the body of water to feed and loaf on shore where they deposit their droppings. 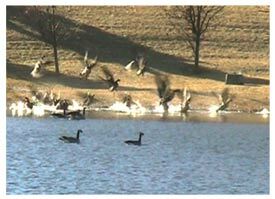 The Goose Guardian Image Sensor recognizes the approach of the birds and sets off a hazing device that startles and scares the geese away without harming them. The development and testing of the Goose Guardian Hazing devices has involved various field experiments to categorize the effect of motion and sound components that in combination are successful at deterring Canada geese. Three (3) designs have matured to Production versions and are currently available for purchase. The Goose Guardian consists of two interchangeable components: Base Unit and Hazing Devices. The Base Unit provides power to the Hazing Device and operates from either 110 VAC or 24 VAC. The Goose Guardian draws less than 3 Amps so the 24 VAC model can be operated from commercial irrigation satellite stations as just another sprinkler head.